It has been freezing here in Honduras and the cold weather just broke today. I think a couple of days before Thanksgiving this terrible cold front blew in. It has been going down into the mid to high fifties at night, and some days it has not even reached 70˚. This has been accompanied with violent wind, probably 30 mile per hour gusts, that have been shaking our house making it difficult to sleep at night. I think with the wind chill factor it probably feels like sixty-five during the day. Laura and I have occasionally had to don a sweat-shirt. The Hondurans have been bundled up like Eskimos and every conversation starts with a comment about how cold it is. Thank God, the wind finally broke this morning and it’s back to a mild 80˚. The forecast over the next few days is for consecutively warmer days. It doesn’t look like we’ll be doing any ice skating or building any snow people before Christmas. It was still cold when we went out to Thanksgiving dinner. Turkey was not an option. I’m told that in some very exclusive supermarkets in gated districts of Tegucigalpa you can find it. Buying it there, however, would have probably been contradictory to the deeper meaning of Thanksgiving. Still, the five North Americans here were very much craving the traditional dinner. We improvised. We went out to the restaurant in Yuscarán, the capitol of the department of El Paraiso, where we reside and just a few towns away. We’ve gone there three or four times before to get away . They serve one plate – there are no menus – the typical Honduran dinner with tortillas, refried beans, cheese, sausage, and some chopped vegetables in a side bowl. The meat varies. You can have pork, beef, or chicken. No turkey, no stuffing, no gravy or cranberry sauce. Still, Laura and I made a pumpkin pie earlier in the day in the director Kristen’s stove (we don’t have a stove, just a hot plate). The pie was great and we savored every bite. Our only regret was that we couldn’t find any whipped cream. Dr. Douglas was with us, a Honduran who works at the local clinic and Kristen’s friend. He loved the pie and so we took the opportunity to school him on the cultural significance of Thanksgiving. Apparently Hondurans too know something about Europeans arriving on this soil and meeting up with an indigenous population. Wouldn’t it be wonderful if the Thanksgiving story, of different peoples sharing equally around a table of bounty, were actually a true one? I guess even as an unfulfilled dream it is still worth celebrating. Both the refried beans and the pumpkin pie were delicious. There was another celebration yesterday that made a more subtle impression. You may or may not know that yesterday was World Aids Day. All of our children either have the HIV virus or have been dramatically affected by HIV/AIDS. In earlier years, there have been service groups from the States present on this day. Part of the day would have included a formal celebration shared by the kids and the visitors. I imagine those celebrations were very meaningful and moving for all involved. But without any special visitors, the day took a more informal course. 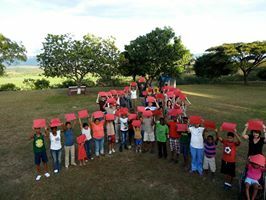 The children were invited to make and write cards from construction paper in memory of friends, family, and other children who had been part of the Montaña de Luz family. Music played in the chapel all day. It was a simple invitation. Late during the day I went into the chapel with my own card. There were perhaps ten to fifteen cards on the wall, some signed and some anonymous. I read the heartbreaking goodbyes to moms and dads, brothers and sisters, and friends who had lived with them and shared a bedroom. It sure made me thankful. It made me think about why I’m here. Honored and humbled, I took a little bit more time in the chapel that afternoon than I usually do. Laura and I are really challenged here. There is a great need for about 20 or 30 social workers. Unfortunately we are the only two. We are beginning to see very clearly what our roles will be. The problem, of course, is that there are too many needs and too few of us. We’ve been thinking a little about how you might help. We are thinking about some special projects that we might need some funds for. We hope to write to you directly by email before Christmas with a bit of a wish list. We won’t be able to do everything. There will never be enough, but we’ll just be thankful for what we have. We actually have a great deal more than we ever realize. And in any case, the pumpkin pie is delicious. Memorial messages like that are always humbling, especially for someone, like me, who has not personally known such loss. 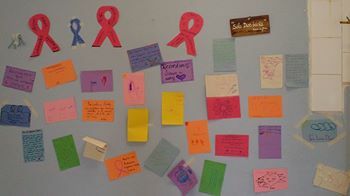 The picture of the display of cards puts me in mind of 20 years ago, when I first saw a portion of the AIDS memorial quilt, and how it brought home to me not only how many people had been direct victims of HIV, but how many had also been affected by losing those close to them. The children’s cards are simpler than a quilt square, but no less poignant. I look forward to knowing how I can help with any projects there.